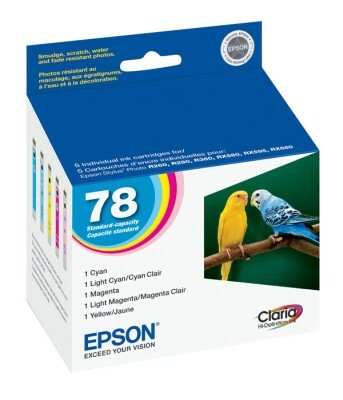 Genuine OEM Epson T078920, Epson78 MuLighti-Pack Inkjet Cartridge. They are designed to work in the Epson Artisan 50 printer/copier(s). Genuine OEM Epson T098120, Epson98 High Yield Black Inkjet Cartridge. They are designed to work in the Epson Artisan 700 printer/copier(s). Genuine OEM Epson T098920 High Yield Five Color Inkjet. 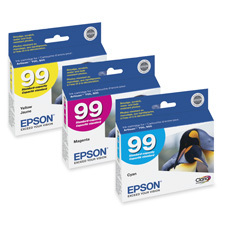 (Multipack) They are designed to work in the Epson Artisan 700, Artisan 710, Artisan 725, Artisan 730, Artisan 800, Artisan 810, Artisan 835, Artisan 837 printer/copier(s). Genuine OEM Epson T099220, Epson99 Cyan Inkjet Cartridge. They are designed to work in the Epson Artisan 700 printer/copier(s). Genuine OEM Epson T099320, Epson99 Magenta Inkjet Cartridge. They are designed to work in the Epson Artisan 700 printer/copier(s). Genuine OEM Epson T099420, Epson99 Yellow Inkjet Cartridge. They are designed to work in the Epson Artisan 700 printer/copier(s).